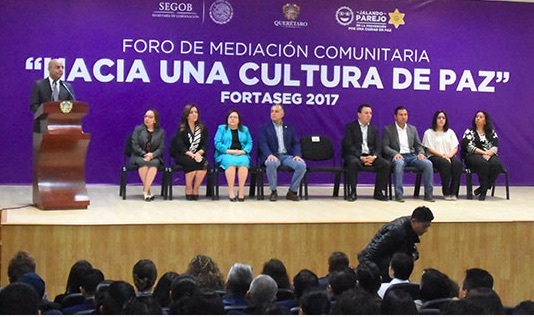 The municipal president of Querétaro, Marcos Aguilar Vega, inaugurated the first forum of community mediation “Towards a culture of peace” Fortaseg 2017, where state and municipal public servants will learn to promote a social transformation through mediation. After seeing a protest at the first Community Mediation Committee of the Felipe Carrillo Puerto delegation, the mayor said that lack of communication is one of the most recurrent causes of conflicts and crimes that put people’s lives and assets at risk. The mayor said that if we achieve an assertive communication, that puts the accent on the collective benefit, we will achieve a definitive step for social cohesion and the strengthening of the Rule of Law. He said that the objective of the Community Mediation Committee is that citizens on an equal basis have the means to peacefully resolve their conflicts, without jeopardizing the fundamental principles of coexistence and mutual respect. “Today more than ever we need a united society that forms a common front against the evils that threaten our well-being such as crime, corruption and the deterioration of the social fabric,” he said. He pointed out that governments come and go, but citizen initiatives remain; He asserted that a culture of peace will be achieved if each citizen, neighborhood, colony and community live by the fundamental principles that govern the culture of peace. The Municipal Public Security Secretary, Juan Luis Ferrusca Ortiz said that community mediation is a new way of approaching psychosocial problems; it privileges neighborhood leadership through the creation of committees that promote alternative spaces for peaceful conflict resolution. He reported that the community mediation model, whose investment is 980 thousand pesos from the resources of Fortaseg 2017, began in several areas of the Felipe Carrillo Puerto delegation. He said that this model will also be taken to other of the six remaining municipal delegations, encouraging participation in community mediation committees. Adriana Báez Sosa, who is responsible for the program, stressed that the capital will be a pioneer in the practice of community mediation, which is committed to strengthening the exercise of citizenship. “This is a great step forward in the municipality of Queretaro, since it recognizes the importance of the community, as well as generating citizen participation, as they are key elements for the solution of conflicts in the community,” she acknowledged. She indicated that this project started with a diagnosis, followed by the creation of a committee of citizens interested in contributing their time to the community, followed by a process of training, dissemination and operation of these areas.